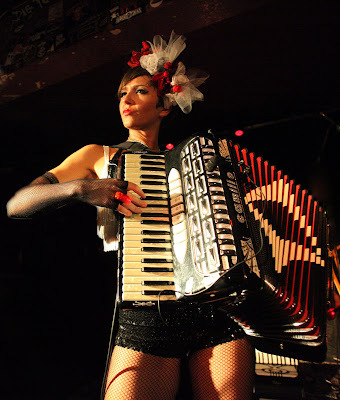 MISS NATASHA ENQUIST: ELECTRO-ACCORDION CHANTEUSE: HAPPY WORLD ACCORDION DAY! Today is May 6th which means it is World Accordion Day! How will you spend this day celebrating the accordion? One way, would be to know how to spell ACCORDION. In other languages, there's the fisarmonica, akkordeon, accordéon... one thing I've noticed since my being here in Orlando is it is regularly misspelled to me as "accordian". EGAD!! Sacre bleu!! No no no! Maybe that's the redneck spelling? I need a Floridian diktionarie! Okay, okay... knowing how to spell 'accordion' isn't really the best way to celebrate the instrument, it was just my way of correcting those who don't use spellcheck! Back to the ACCORDION! Let's celebrate together, go through your musical library and realize how much music you have that includes the accordion within it. Embrace the sound of the richness in the reeds, how having this instrument in a song adds so much texture, atmosphere and mystique. It surprises me how many times I am asked at my job "What is this instrument called?" Let it be known, IT'S THE FURIOUS AND FEROCIOUS ACCORDION! Bow down to the mighty accordion, for it will save the world, and I - it's loyal servant - will continue to spread melodies, knowledge, and awesomeness of this instrument to audiences of all ages.